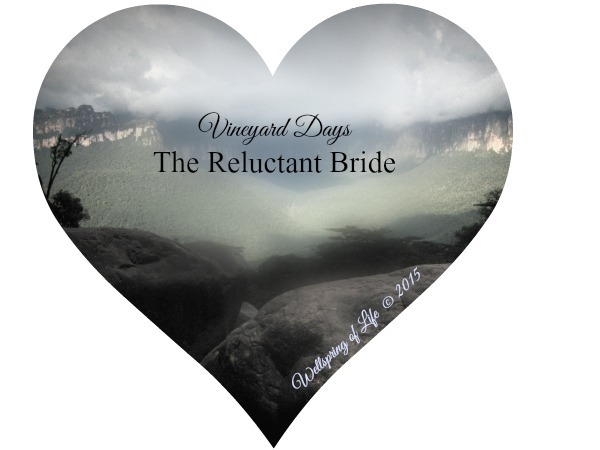 Author’s Note: The following was recently published on Wellspring of Life in a continuing series entitled Vineyard Days, featuring teaching posts from the Song of Songs and John 15 – Jesus and His church, the Bride of Christ. and the shadows flee away? Months ago, in part three of Through the Lattice, we readers were introduced to the reluctant Bride. Somehow I think she is familiar, for she is us. We can identify with her reluctance but why, why did she send Him away? Why do we ‘send Him away’? The story of the reluctant Bride did not begin with our friend the Shulamite. By the time Solomon wrote the Song of Songs, many moons had passed since Jehovah Elohiym had strolled in His garden with eager companions who looked forward to His arrival in the cool of the day. The atmosphere He created – this cool of the day – had been a time of refreshing; an occasion of joy and anticipation; a daily communion, when the breath-blow of the Lord God brought their senses alive and quickened their understanding. It was never His intent that separation occur, though He knew it full well. The Bride has with slow reluctance been coming out of hiding ever since. But, she is emerging. This too He knew full well. Outside of the Literal used above, most translations do not have the Shulamite posing a question. Yet, isn’t that where our minds often go? It is not that the reluctant Bride is without desire to know and walk with her Beloved. It is that detaining influences surround her, both within her own heart and without. How difficult it is at times to want to swim upstream in the world around us in order to lay forth new life. Then there are the shadows. The shame and fear that took hold of the first Joined Ones in the Garden is referenced in the drilling down of the Hebrew meaning of shadows. If there are two things that have most held back the Bride, the Church, from stepping fully into her divine position in Christ Jesus, I suggest shame and fear would land near the top of the list. Today’s cultural mantra of No shame! and No fear! is an upside-down attempt to throw off the restraints of shame and fear that still bind from the first hiding in the Garden. Only the Agape love of the Lord God truly sets the prisoner free of shame and casts out fear. (I John 4:18) It is His love that in-courages us. In the natural sense of the marriage covenant, how often have shame and fear dampened godly desire for one’s spouse? Where shadows have come, retreat and ‘sending away’ the other from oneself is commonly practiced. The longer it is indulged, the wider the division and sense of separation. Continued on, whether through divorce or emotional separation while remaining married, in slips the twilight. What was once the anticipated cool of the day in the marriage relationship is now a prelude to long, cold nights. Unfortunately, practicing retreat and sending away is too easily projected onto our spiritual bridal covenant with the Lover of our souls as well. Shame and fear may no longer look like shame and fear. Instead, they may take on the form of independence or control, reliance solely on the Daughters of Jerusalem instead of the strong arm of the Lord, or sending Him away because we think He has failed us. How quickly we forget that only He can bridge the gap of the mountains that separate and divide (Bether = division). Night closes in deeply in the mountains. We need the One we love. Until when do the shadows flee away? So questions our friend the Shulamite. I’m glad she asked as it will help us to listen in the darkness. Shammahs Field LLC/Shammah Ministries is the biblical counseling, life coaching, and spiritual growth ministry entrusted to Wayne & Nancy Bentz. You can learn more about the resources they have to offer at shammahsfield.com and nancybentz.com.